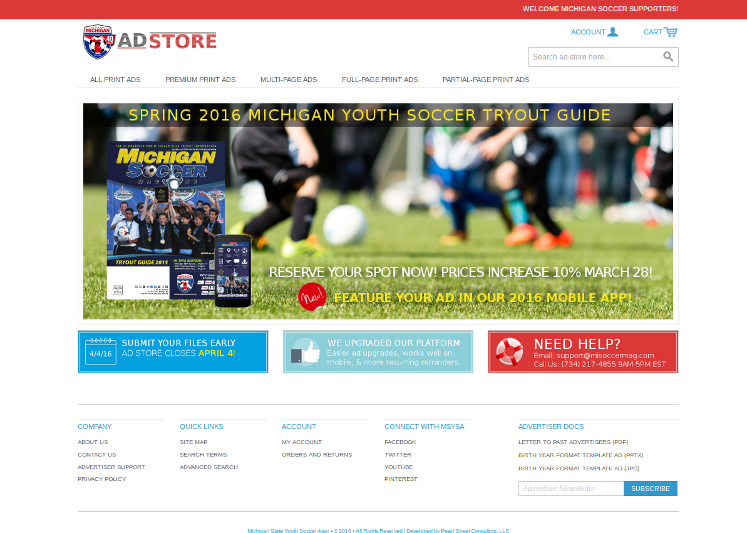 The Ad Store is a unique advertising sales portal prototype built for the Michigan State Youth Soccer Organization. Tasked with managing the advertisement intake process for our client’s chief publication, Michigan Soccer Magazine, their website, and a set of iPhone and Android apps (which we developed, by the way), we deployed an eCommerce solution built from the ground up to utilize automated workflow technology. Our solution manages the complex process of handling payment and ad file deadlines, and multiple options per ad, for literally hundreds of advertisers simultaneously, efficiently, and without error. The management of hundreds of advertisers, their payments, their advertising files, all on deadline is a complex process some organizations simply throw more staff at. If you’re a publisher who handles advertisers, their graphic designers with their multiple versions and last minute changes, and accounting specialists who are late on payment, you understand this process can also be quite expensive. Michigan Soccer needed a solution that was smart and would utilize automation wherever possible to streamline and “depersonalize” the process. Tapping into resources available under one of our initiatives, Open Source For Print, we selected Magento as our eCommerce solution. In order to provide the expected automated process we extended Magento’s core functionality with a custom extension to handle the complex business of dealing with designers and all their files, and accounting specialists, their late payments. The site accepts payments by credit card or check. Payment and “files due” reminder intervals are custom set in the backend allowing for an “escalation process” which encourages timely payment and ad file submission. This site accepts all major credit cards through integration with Paypal’s payment processing platform. Advertisers can also pay by check. Advertisers are notified automatically via email upon receipt of payment. This mobile responsive website was created with Magento, and other freely available open source tools, allowing us to not have to charge for reinventing the wheel. This site was fully operated by Pearl Street support staff, allowing us to take full control of the advertiser intake process. This allowed our client to focus on their core organizational needs while handing off a complex “people process” to us. Pearl Street is a truly professional business with competitive prices and very enjoyable platform that provided quality delivery on our projects! Very impressive responses from our customers and prompt support when needed at all hours!…[Choosing a vendor] wasn’t an easy decision by any stretch due to the magnitude of the project. But, we know we made the right decision. Director of Programs, Michigan State Youth Soccer Assn.